"I love this city, and always shall. I write about it. I dream about it. I walk its streets and see something new each day - traces of faded lettering on the stone, still legible, but just; some facade that I have walked past before and not noticed; an unregarded doorway with the names, in brass, of those who lived there sixty years ago, the bell-pulls sometimes still in place, as if one might summon long-departed residents from their slumbers." Edinburgh is a city of stories - a place that has witnessed everything from great historical upheavals, to the individual lives of a remarkable cast of characters. Every spire, cobblestone, bridge, close and avenue has a tale to tell. 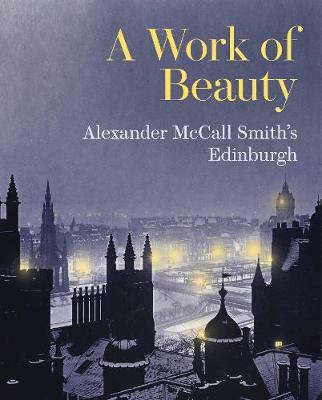 In this sumptuous new book, Alexander McCall Smith curates his own, distinctive story of Edinburgh - combining his affectionate, incisive wit with a wealth of stunning imagery drawn from Scotland's national collection of architecture and archaeology. Through a series of photographs, maps, drawings and paintings - many never before published - he takes the reader on a unique tour. Just like the city's architecture, the book can move in an instant from sweeping views to secret, hidden vignettes.This is a story of famous landmarks and lost buildings; the people who made them; the people who lived in them. 'A Work of Beauty' is an intimate portrait of a city by one of Scotland's greatest storytellers.